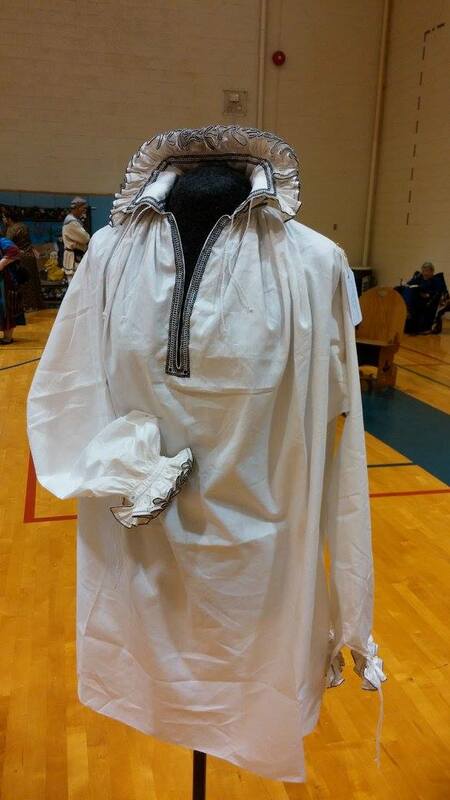 A year and a half long project of finishing an exact (give and take the adjustments to my size) replica of a shirt from 1567 is finally completed. The project has been both hated and loved, sometimes at the same time, and thought me both to try new techniques, sharpening my handsewing skills and gave me an incredible opportunity to study all the details of a almost 500 years old shirt. In 1567, members of the Swedish nobility (Svante Stensson Sture, Nils Svantsson Sture, Erik Svantesson Sture, Abraham Gustafsson Stenbock and Ivar Ivarsson Liljeörn) were executed for plotting against the Swedish king, and their last worn clothing was kept by the Sture family as a relic and reminder and to ensure that this tragic part of their family history would never be forgotten. The clothes were preserved in an iron chest until 1883 when they were incorporated into the Swedish History Museum. In 1948 Anna-Maja Nylén was appointed the task of conducting a thorough investigation of the clothes, including four linen shirts, to document the present condition (Nylén p 217-218). This set of clothing is today known as Sturekläderna, the Sture Clothing. The sleeve is whip stitched to the cuffs, and the ruffles keeps in place with back stitches. The original sleeve have a lacing hole on one side and traces of a cord on the other side. The fabric is a hand- or early 20th century machine woven, almost identical with the specific width of the original fabric used. The width of the fabric was crucial due to the specific way the shirt is constructed, with tiny whipstitch along the selvedge. The shirt is sewn with linen thread by the same kind of stitch used on the original shirt. The ruffle on the collar is 498 cm long and the cuffs 249 cm long piece each. All the ruffles has a decorative drawn thread work and are also decorated on the edge with a handmade 4-ply black and white silk thread. The paper The Sture Shirt Project is free to download. This paper is also free to use in educational purpose, but please be sure to always include my name and a reference to this webpage. Honour others work and I will be happy to return the favor. Right: Collar and cuffs ruffle are both decorated with a drawn thread work and a black and white silk braid is whip stitched to the edge. The total length of the ruffle is around 10 meter/32 feet (5+2.5+2.5 m). A special thank you to Malin Berglund, Margaret Sanborn, Kevin Laurell, Mike Murphee and Adrian Sawyer for both technical advice of the terminology and the proof reading and commenting. Any fault in grammar or misspelling is completely my own and the disadvantage for not speaking English as a first langugage. I would also thank Sarah Thaler and Margaret Sanborn for the help with making the braid, it means a lot for me that you both had the time to assist me when I was running out of time. Amber Kay, Cynthia Konow-Brownell and Bridget MacKenzie, without your technical expertise in teaching me how to make the braid, I would never have been able to enter the competition at all. Thank you Agnes Edgren and Lotta Ahlen for patiently listening to all my rage and worries and excitment during the process, and letting me bug you with the proud photos shoots of every single step. And last, but not least, a thank you to my husband for all the support you given me during the process! This entry was posted in Undergarment 16th c and tagged 16th century Chemise, 16th century underwear, Sture Clothing, Sturekläderna, Stureskjortorna, Sweden 16th century, The Sture Shirt. ← Landsknecht Cap …what should a man wear underneath his hat?